The United States and Cuba will re-establish diplomatic relations, ending a vestige of U.S. Cold War policy. Earlier this week President Barack Obama and Cuban President Raoul Castro began to close one of the final remaining conflicts of the Cold War. 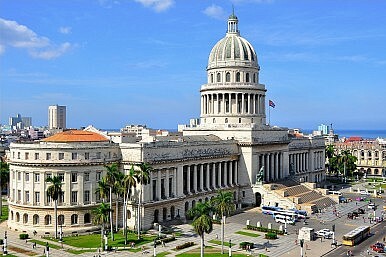 Although the contours of the deal have yet to fully take shape, Havana and Washington will soon enjoy official diplomatic representation in each other’s capitals for the first time since the 1950s. Cuba played an outsized role in the Cold War, providing a beachhead in Latin America not only for Soviet missiles, but also for Moscow’s broader diplomatic and ideological project. Havana also played a major role in the brushfire wars of the 1960s and 1970s. This willingness to tease Washington had made some wary of the role Cuba might play in the contemporary geopolitics of Latin America, whether as a partner for Venezuela or as part of the advance guard of a Chinese move into the region. The opening to Cuba is surely historic, but less so in its end than in the duration of the cold peace. Consider; when the embargo against Cuba began, the United States was at the very beginning of its long involvement in the Vietnam Wars, an involvement that would eventually cost the U.S. 59,000 dead. In this context, the long wait for rapprochement with Cuba is not so out of the ordinary. It took the United States 23 years to engage seriously with the People’s Republic of China. Normalization with Vietnam came 19 years after the fall of Saigon. The United States still, of course, does not enjoy normal relations with North Korea. These examples also suggest that political change will not come quickly to Cuba. Opening to and engagement with the liberal international economic system has not, thus far, transformed the politics of either Hanoi or Beijing. Then again, Cuba is far more exposed to American culture, media, and capital than anywhere in East Asia. If the hypothesis that free markets leads to free governance will work anywhere, it will be with Cuba. The geopolitical stakes of an American opening to Cuba are as low as they’ve ever been. It strains credulity to suggest that Beijing and Moscow are carefully watching this, probing for American weakness. If Moscow still cared about Havana, the opening would undoubtedly be understood as a dire threat to Russia interests in the region, but right now the Kremlin has far more important things to worry about. Similarly, reform of the Cuban economy and government is more likely to provide Chinese business with additional investment opportunity than to rob Beijing of a friendly shore in American controlled waters. The direct legacies of the Cold War are dwindling, with the cross-straits relationship and the Korean divide remaining as the most prominent reminders. Unfortunately, neither of those conflicts are as easily resolved as the U.S.-Cuba dispute. Did Obama's 'Red Line' Fib Matter in the End?Think Xi Jinping's State Visit to the US Went Well? Think AgainAhead of Second Summit, Kim Jong Un Expresses ’Great Satisfaction’ at Letter From TrumpFrom a Slow Simmer to a Boil: Managing Tensions in a Heating South China SeaUS-North Korea Talks Are About to Spin Up Again: What Does Pyongyang Really Want?